So, what is Malign Portents? Well, it's a campaign book, plain and simple. 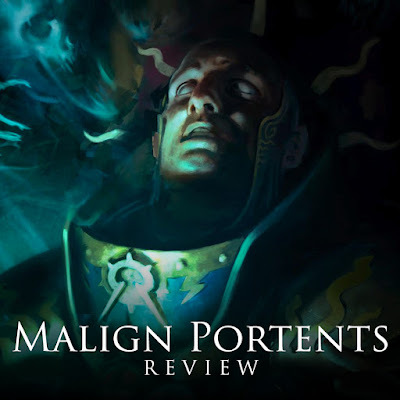 Unlike the Realmgate Wars books, which covered each story from beginning to end, Malign Portents instead sets up the current atmosphere in the Mortal Realms and lays the groundwork for what is surely to come. The cover on the book is fairly simple, but does a great job at conveying the more macabre nature of the story. Once you crack it open we immediately begin getting little bits of story to set up the Time of Tribulations, which is the troubled era we find ourselves in now. The first bit of lore briefly covers the Age of Myth and the Age of Chaos. This is a bit of a reintroduction to the mythos of the Age of Sigmar. It's great for people just jumping into the hobby, since it summarizes everything nicely, but it also has new information for veteran players, firming up some ideas that were kind of nebulous or merely hinted at before. For example, it straight up says that the different Realms were created from the leftover energies of the Winds of Magic from the world-that-was. While this was strongly implied before, I don't think it was ever stated as a fact. From there we move onto a recap of the Realmgate Wars themselves. There's not much new here, but it does sum up everything from those campaign books in about two pages. Sprinkled throughout all of this we get little snippets of narrative story, making sure the overall feeling of the book is maintained and focused on the Malign Portents event, even when we backtrack through the different Ages. There's a cool story with Nagash ordering Arkhan to collect all the realmstone from the edges of Shyish and bring it to Nagashizzar. This has some classic ALL CAPS NAGASH DIALOGUE, which I'm happy to see return. In one of the coolest bits, this book delves even further into what the Mortal Realms are. We learn that each is roughly spherical and they are all surrounded by the Great Nothing, a bunch of unaligned magic, and around that, the Realm of Chaos. We get a little bit of information on the major realms we've visited so far like Aqshy and Chamon, and then jump into the newly formed cities of Sigmar. We read about all of the ones we already knew about, like Hammerhal, but also get small glimpses at a few new ones like Glymmsforge in Shyish. With the previous background firmly established now, the story shifts into the malign portents this book is named after. Strange occurrences begin to pop up across the Mortal Realms, from corncobs filled with human teeth, to villages disappearing and whole graveyards coming to life, it's generally an unsettling time to be alive. Everything here is really cool to read about, and genuinely shudder inducing. The denizens of the realms began to react to the omens, such as burying their dead in iron cages to prevent them from returning from the grave. The one to finally convince Sigmar of the importance of these portents was Vandus Hammerhand himself, which we get to ready in a little side story. Not one to take direct action anymore, Sigmar instead flung meteorites of Azyrite realmstone down amongst the realms. These potent stones granted heightened abilities to decipher the omens, and atop them were built the Warscryer Citadels. Next we get a look at the background for each of the new Harbingers, as well as a bit of background on the motivation for their Grand Alliance as a whole. The Lord-Ordinators are a mix of engineer and prophet, and it was they who built many of the Warscryer Citadels. The Darkoath Warqueens were chosen by the Chaos Gods to lead their followers as a united front into Shyish. We also get a bit of a look at how each of the Chaos Gods reacts to the portents, and why they are so concerned with them, including Slaanesh and the Great Horned Rat. Destruction is being led by the Fungoid Cave-Shamans, who are Moonclan Grots who've eaten a bit too many mushrooms, but have been granted visions in return. The Knight of Shrouds are traitors who betrayed their people to Nagash in life, and are rewarded/punished in death by being made into one of the Lord of Undeath's lieutenants. There's a bunch more detail for each of them, with some really cool bits, but I can't just retype the whole thing here. It's definitely worth reading. It wouldn't be a Death centric release without a further delve into Shyish, and that is exactly what we get. It's similar to what's covered in the Legions of Nagash book, but with a larger word count to fully explore it. Shyish was a prosperous realm, just like the rest, before the return of Nagash. Each civilization has its own underworld reflected within the realm, created from their collective belief in it. The center of the realm, called the Innerlands, is where mortals can live, while the outer portions are virtually uninhabitable, with death magic in abundance. The realmstone of Shyish took the form of Gravesand, forming vast deserts near the borders of the realm. Each grain of sand represented a single mortal life, and if a mortal were able to find their own grain of sand, they could cheat death indefinitely. It's this very gravesand that Nagash has ordered be brought back to Nagashizzar where he is building great monuments out of it, using vitrified stone. Massive inverted black pyramids float above the city, drawing the death magic into it. In so doing Nagash had shifted the greatest concentration of magic from the edges of the realm, to his own seat of power. All of this sand was brought to him, one grain at a time, by massive rows of skeletons, working tirelessly. Even though they are dead and mindless, to hold more than one grain of sand at a time would be too much for them to handle since they are so packed with death magic. This is where we join the actual narrative for Malign Portents, with the forces of Chaos the first to breach the Realm of Death in order to stop whatever Nagash has planned. The story here follows them as they make their way across the realm, encountering various Death warbands, as well as the forces of Destruction and Stormcast from the Anvils of the Heldenhammer stormhost. There are a bunch of cool bits in here, like a Brayherd warband with a macabre obsession with death, ambushing grots, and cunning deceit. I can't really go into it more without ruining the story. In place of a timeline, we get a smattering of story hooks from the Time of Tribulations, like the origins of Keldrak, the main Knight of Shrouds that we follow. We also take a look at Nurgle's incursion into the realm (covered in some of the short stories on the Malign Portents website), some enterprising Skaven who seek to harness the power of the Gravesand themselves, and some Beastclaw Raiders who find a bit too much in common with the Flesh-eater Courts. It's all really cool, with some truly inspiring bits. In fact, Steve Foote, of Realms at War fame, has already made a really cool conversion of the Skaven Grey Seer based off their story hook. Just like in other books, we get some nice model photography showing off the forces involved. There are some cool shots in here with all four forces converging on each other. There isn't a ton of new art in the book either, but what there is is pretty good. 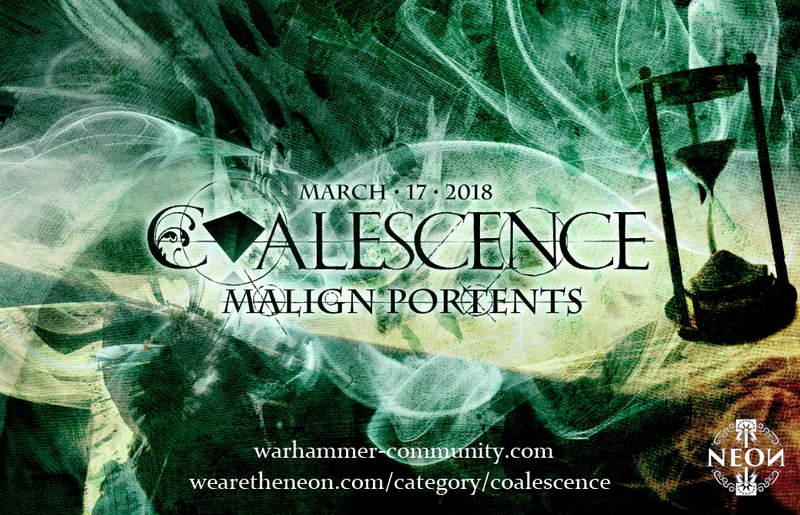 I guess a lot of it is new, but it's all been previewed on the Malign Portents website already, some I'm a little spoilt I guess. The character artwork for each of the Harbingers is outstanding, with the Darkoath Warqueen and the Knight of Shrouds being my favorites. There's also a really cool piece showing a Hexwraith charge. Now we're onto the rules. Since this is a campaign we get a new, more comprehensive set of rules for fighting battles within Shyish. These look ace to me and I'm really eager to try them out. We get new magic, new command abilities, new battlefield wide effects, and a table called the Power of Death. On any turn following a turn in which at least one unit was slain you get to roll on this table, adding the number of slain units to your roll. This can give you anything from a +1 to cast for the turn to the ability to pick an enemy unit and roll a dice for each model in the unit, causing a mortal wound on a 5+. Obviously the more brutal stuff like that is on the higher end of the table, meaning you're only going to get that if a lot of units were killed the turn before. There's also a rule in here called The Legacy of Nehek, where it mentions Nagash of Nehekhara. This made me very happy indeed, even if it's just a passing mention. The big new addition to games fought in the Time of Tribulations though are the rules for the Malign Portents themselves. You earn a certain number or prophecy point each turn, with bonuses granted for having a Harbinger, a Warscryrer Citadel, and a few other things. This can be spent to interpret signs which grant in game bonuses, but you muct pick which Malign Portent your army is following at the start of the game. There is The Falling Star, The Bloodied Skull, The Black Void, The Balemoon, The Writhing Serpent, and The Red Mist. Each of these Portents has six signs, each costing a different amount of prophecy points to use. For example, if you picked The Black Void, you could spend two points to make a friendly unit within 18" of the interpreter have the fly ability for the phase, or spend five points to add two to the casting of all spells and reduce their range by 6". Any hero in your army can interpret these signs, though they can only use each sign once per turn. Any points you don't spend are lost at the end of your turn. It's nothing game breaking or game changing, but it's a fun addition to them, and is fairly balanced since you'll both have access to use them. There is also a fairly large skirmish section in here. You get skirmish points for the Harbingers, a revised way of getting prophecy points (you don't earn as many), a few exclusions of signs that are too powerful for skirmish, command abilities, artifacts, mysterious terrain rules, and new spells. There is also a special Malign Portents scenario for skirmish called The Well of Souls. Skirmish isn't the only place we get new scenarios though. There are two new ones for Narrative play, following along with the storyline from the Doomed March. The first, Blood Moon Rising, represents an ambush on a marching army, while They Came From Below is great for a triumph and treachery game. There are suggestions in there on how to link the battles up too. Interestingly, there are also two Pitched Battle battleplans. Both of these seem fairly balanced, and have a slight tweak to the prophecy points rule. For every 500 points in your army you receive 3 prophecy points instead of generating them the normal way. So in a 2,000 point game, each of you would be getting 12 prophecy points each turn. This is even phrased in a way that makes it sound like the Malign Portents rules don't even need to be used for these. I would be interested to see these thrown into the mix of scenarios from the General's Handbooks for tournament play, just with the Malign Portents rules removed if you're not using them. Heralds of Woe seems particularly interesting with you scoring points by having units in your opponent's territory at the end of the game. Last, but not least, we have the warscrolls for the four new Harbingers. Each of these also has access to a unique set of Malign Portents they can use in addition to the ones from the Malign Portent you pick for your game. The rules for the Warscryer Citadel is also included, as well as points for everything. The Harbingers have special rules that allow them to be taken into any army of their respective grand alliance without using up ally points or breaking the allegiance. They can even be your general. The only exclusion is that they cannot take command traits or artifacts unless their keyword matches your army's allegiance, so the Lord-Ordinator in a Stormcast army for example. Overall, Malign Portents seems like a home run for me. Not only does it advance the storyline in an interesting new direction, it also reframes some of the past lore in a more relatable and focused format. Stuff that was merely hinted at before is now stated, making the Mortal Realms feel like a more concrete and substantial place. The main draw for this book is definitely the lore and story, but the rules inclusions are great too. I definitely want to play a few games using the Malign Portent rules, especially fighting battles within Shyish. If there is any book which is a must have for anyone playing Age of Sigmar, it would be this one. It's a great entry point for new players too, setting up all of the past lore and letting them fight it out in the new setting. If you haven't already gotten this book, I would highly recommend that you grab it. It's fairly cheap too, at only $25! Games Workshop is running the Dread Solstice campaign, a worldwide Malign Portents campaign, to coincide with this release, and there is also a new Coalescence event on March 17th tying into it as well. Coalescence is a worldwide, one day narrative event. To find out more about it and/or register to run it for your local scene, check out the We Are the Neon website.